Mercia Ballard is the new Duchess of Pemmington Moraine. She is nothing but a toy to the cruel Duke, a man notorious for his ties to the dark arts. 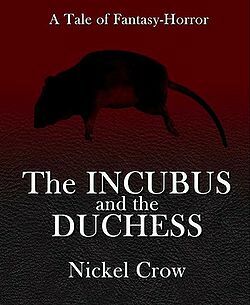 Rumors abound that the Duke murdered the former Duchess, Jacqueline, in a fit of jealousy, but Mercia learns a truth far more terrifying from an Incubus named Christopher who hates the Duke and wants her desperately. Christopher reveals a dark secret – the former Duchess is trapped in the dungeon keep, her face covered by a grotesque leather mask. Can Mercia discover the terrible reason behind Jacqueline’s imprisonment, or will she suffer the same fate? There was nothing to redeem any of the characters at any point in the story. All it consisted of was abuse, anger, and no real explanation of why that was necessary here. The confusion on the supposed heroine of the story I felt in myself as the events seemed disjointed and put together for the sake of shock and not much more than that. I admit that I do not like horror stories, but what I like even less are horror stories that are mostly torture and abuse for the sake of it. If there was a point to this work, I can’t quite see what that is and that bothers me. I can see the theme of infidelity, that’s bluntly obvious, but otherwise? What else is there here? The Incubus of the story is less of an Incubus and more of a spirit possessing bodies in order to seek its revenge. In that the revenge is of a sexual nature does not make this being an Incubus. There Is the barest hint of some small amount of the powers on an Incubus, but overall I cannot see the connection here. As this is a story of possession, there isn’t anything to explain or describe of the Incubus save that he is brutish, evil, and encompasses all that a being of revenge would be. While described as one, I came away from this story not accepting that description as a reader. Still, the main characters call him one, so therefore in this world be then is. That does not mean that I have to accept that however. It is written well, the characters are well created and the story didn’t have anything that was out of place or seemed to be full of errors. But I still didn’t care for it much. One pitchfork out of five. Did not care for the story, not at all. Your Majesty was even less subtle than usual about her dislike for the story, therefore Your Majesty’s heart is at a loss to understand the one pitchfork. Good spelling?